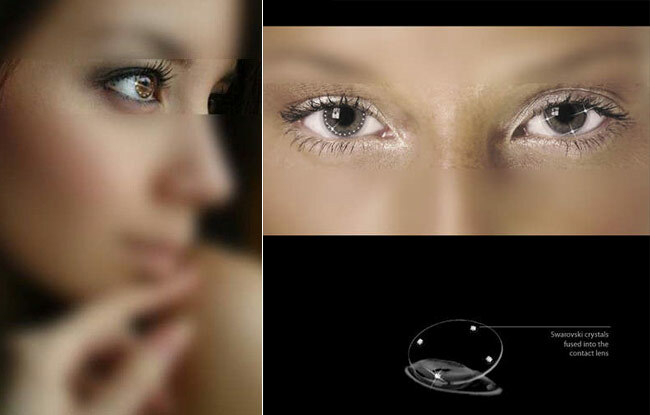 Some of you may have already seen these pricey special contacts that range around $100 to $1000 per pair. 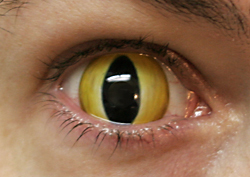 They work wonders at Halloween parties and are commonly used in production of movies for that extra look. A frequently asked question about such lens is how they literally affect vision. Most of these reduce sight to tunnel vision so they are generally just used during special occasions. As for safety, they are FDA approved. The set of contacts below are from (here). 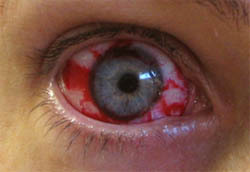 The contact lens pattern immediately below resembles a goat's eye and is titled as such. The Goat Eye lens or is it Hypnotoad?! 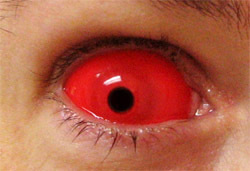 On the left and right respectively: Red Sclera, Hemorrhage. There was actually a design with a little less blood and titled "Bloodshot". I have a hard time imaging anyone paying $300 to look like they had a horrible day at work and are sleep deprived. 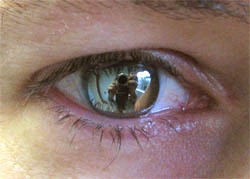 On the left and right respectively: Mirrored Riddick, Cat Eye. It is unfortunate that the site selling the Mirrored Riddick lens restricted them to film producers only. They look very cool but perhaps they are restricted for safety reasons. The next set of contacts are from (here). From left to right are designs: Patchwork, Flames, Skeletal Teeth. 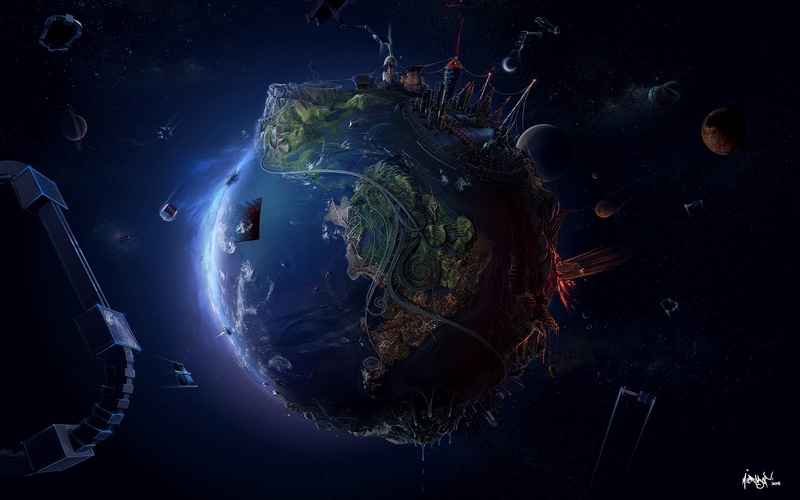 Anyone else think the Patchwork lens is comparable to the Google Chrome icon? From left to right are designs: Smiley, Rave Blue, Medusa. The Rave Blue definitely holds potential for ravers out there. Most of the lens variants displayed so far are limited to special occasions like Halloween or parties but Swarovski lens are targeted towards more frequent use. 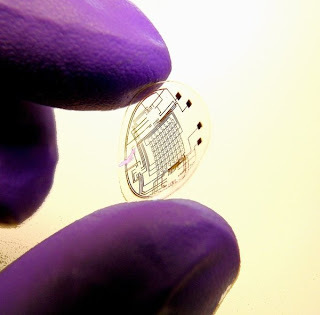 They have embedded crystals in the lens to improve looks by functioning similar to jewelry. 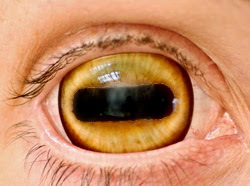 these would definitely scare the crap out of someone... and yeah, that does look like google chrome, i want it! Remember Charles Dance wearing smiley eyes in Last Action Hero? Back when I started getting contacts I wanted to get some colored ones but I never know they made some as awesome as this! Now I sure need to get one pair soon! ahaa my girlfriend has a set of scary ones like some of those! Sick and cool! A mate had cateye-lenses once, it was really cool, and an amazing icebreaker on town. Ooh, I think the Swarovski ones would be uncomfortable. Wouldn't there have to be faceted pieces in the contact to get that kind of sparkle? Save it for the movies! I will punch you in the face if I see you wearing these. Also it's amazing they're using nanotechnology!